House Bill 2542 was brought before the Oregon House of Representatives on March 11th and passed unanimously; the Bill will now need to be passed by the Senate before becoming law. Joshua Shulman, a personal injury lawyer who testified for the Bill before the Judiciary Committee, is glad the House saw the benefit of this bill and hopes the Senate will do the same. Joshua Shulman outside the Capitol in Salem, OR before testifying in the Judiciary Committee for House Bill 2542. Increasing the civil penalties for hit and runs brings us one step closer to justice for these victims. The Oregon House of Representatives passed House Bill 2542 on Monday with 57 aye votes and 0 no votes (3 were excused). This unanimous passage of the Bill is greatly appreciated by its supporters, especially those who have lost loved ones to hit and run accidents. “As a lawyer, it is my great privilege and honor to be allowed to sit with injured people – or, when they’re terribly injured, or killed, with their families. Increasing the civil penalties for hit and runs brings us one step closer to justice for these victims,” Portland attorney Joshua Shulman said. 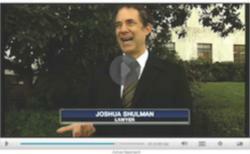 Shulman was one of four people to testify for BH2542 before the Judiciary Committee. HB 2542, if passed in the Senate, will increase the civil penalty for those convicted of serious injury hit and runs. If someone “fails to perform the duties of a driver” and leaves the scene of an accident, it is a crime (ORS 811.705). If the victim in the accident is seriously injured (as defined by ORS 161.015), HB 2542 increases the time period that the driver’s license can be revoked from one year to three years. The penalty for a fatal hit and run will remain five years without a license. This House Bill was sponsored by Representative Chris Garrett (D – Lake Oswego). Garret said he got the idea for the bill after reading about hit-and-run victim Robert Skof in The Oregonian last year. Skof was badly injured and the drunk driver left the scene, but eventually the driver turned himself in to Portland police. Skof received a settlement with the help of his Oregon hit-and-run lawyer Sean DuBois. Two of the other people who testified for the Bill have lost family members from hit and runs in recent years. According to an article published December 21, 2011, in The Oregonian, Kristi Finney’s son Dustin Finney was hit and killed in August of 2011. He was riding his bicycle at the time, and the driver has since been sentenced to five years in prison. Finney believes, like Shulman, that if hit-and-run penalties were harsher, then drivers would be less likely to leave the scene of the crash. Tammi Beers, who also testified,lost her son Harley Rocher, 18, in January 2013 and the driver has not yet been found, according to the article published January 15, 2013 by the Portland Tribune.